FREE SHIPPING! Limited time offer. 30% from each ND T-Shirt sale will be donated to Save the Children Organization to help children in immediate need worldwide. 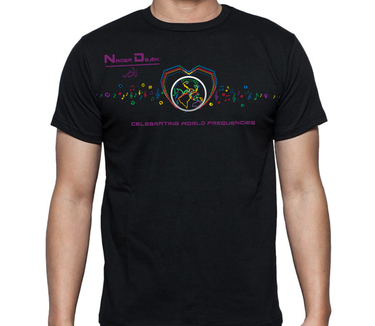 T-shirt features Nader DeAik’s new logo and concept. This unique logo carries a message of Celebrating world frequencies in a rare of its kind world with love. The logo consists of spectrum heart, globe with bright halo, music notes, circles with letters forming into the word Nader. Nader is a Middle Eastern word which means extraordinary and rare. 25% from each Sahran Album (physical CD) sale will be donated to Save the Children Organization to help children in immediate need worldwide. 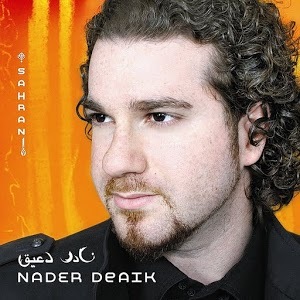 Sahran is Nader DeAik’s first 9 original track album. It includes an exquisite blend of world music genres forming into a Middle Eastern pop album to remember! Sahran includes ART top 10 hit song “Rajae” along with its music video that is broadcasted world wide. It includes the energetic popular hybrid song “Orqus, Baila”. 50% from each signed Sahran Album (physical CD) sale will be donated to Save the Children Organization to help children in immediate need worldwide. CDs will be personally signed by Nader DeAik. If you wish to personalize CDs, please provide your message and a name under Order Notes section during checkout.